I'm joining a group of roughly thirty other ladies in a Virtual Curriculum Fair! This week's topic is Discovering Patterns: Mathematics, Logic, and Science. Like last week, there are so many things I could talk about here. Since I have two students who I've been struggling with as far as being ready for algebra, though, I thought I'd focus on that. My kids have all found that they "get" math. The theoretical part of it, anyway, they have all found to be fairly intuitive and rather easy. That is both a blessing and a curse, I'll tell you. Because they understand it when they hear it, they don't think they need to practice it with real problems. At all. So when I'm not being consistent (if I were to have "a word" for 2014, I think "consistent" would be a good choice) and I'm trusting my kids to do what they tell me they are doing, they blow off math because it is "easy" and therefore something they just aren't going to bother with. In the real world, what that means is that my 9th grader is at a standstill in algebra. He understands the concepts, but he has a hard time actually doing the work. So we are taking some time to back up and make sure the foundations are actually in place. While I'm at it, I'm doing the same for the 7th grader. Because I'm positive he can do algebra as an 8th grader, if he shores up these foundations. I don't want to be spending a whole bunch of money, nor do I want to take a lot of time (especially for the 9th grader). But it is really important to me that we make sure he has thoroughly covered those foundational skills so he can succeed in Algebra. So I have about a 4-month plan for pre-algebra for them. My decision, after looking at lots of possibilities? We're going to work through some videos -- products from MathTutorDVD and Mathtacular. We've been working through the The Basic Math Word Problem Tutor DVD, and so far they are finding that to be WAY too basic. However, I know it will get to the point that they do need to see it. The first four lessons are on word problems using the four operations (addition, subtraction, etc.) with whole numbers. With this, we are "just" watching the lectures and talking about them. They are talking back to the TV occasionally (mostly with answers to the questions Jason asks). Although the first four lessons are simplistic, it then gets into more complex problems, involving decimals, fractions, percents, ratios and proportions. That is why we are working through these. And if I didn't have sick kids last week, we would have gone through those first ones faster, but I decided to cut them some slack. That means a lesson a day here, or three weeks in total. I reviewed The Basic Math Word Problem Tutor a couple of years ago, and I know it did Connor and William some good then. William just needs a refresher. They don't know it yet, but today we are starting MathTacular 4. The MathTacular vidoes are really wonderful. This one is about word problems, and it involves a very silly storyline about a kidnapped pig. There is a pretty good-sized workbook that goes with this, so the kids will be attempting the problems before watching Justin and Amber figure it out on the DVD. What I love here is that it is silly, but they are taking you step-by-step through the problem solving process, and while it starts with very basic math (the very first problem boils down to 4+3= ? ), by the end, they are working algebra problems. That first problem isn't as easy as it sounds though, as it is pointing out one of the biggest problems I think that kids have with word problems. Extraneous information. You are adding goats, so you read about all of their names, which one is her favorite, how old they are, where they came from, and probably more. But the bottom line math problem is that she had 4 goats, bought 3 more, and wants to know how many she has now. We're starting off at a pace of three sections per week, which would mean we'd complete the whole thing in nine weeks. We may slow that down towards the end though, we'll see. I've owned this set for YEARS, and we've never truly used it. That is being rectified now. When we finish the MathTutorDVD Word Problems, we'll be picking up The Pre-Algebra Tutor: Volume 1, along with the worksheets CD that goes with it. This is another product I reviewed a while back, only without the worksheets. My plan is that we'll be spending about three days per section on this. Watch the video and do a worksheet or two the first day. Then do a few worksheets each of the next two days. Then move on. 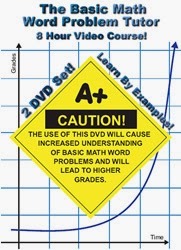 There are nine sections on this DVD, covering real numbers, absolute value, the basic operations with integers, powers and exponents, and more. The worksheet CD has over 250 pages of worksheets, and I am really looking forward to that. 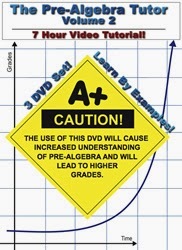 Then, we'll do pretty much the same thing with The Pre-Algebra Tutor: Volume 2 and its companion worksheet CD. This one has sixteen sections that deal with factors, multiples, fractions, variables, and expressions. I'm hoping to do the same roughly 3 days per section pace through it, but we may need to slow down, or the kids may not be able to continue together. We'll play that by ear. My hope is that by hitting some of these problematic topics multiple times in at least a couple different ways, we'll really "get it" and they will both be truly ready for Algebra. Ask me again in May, when we've finished all of this. A note about why I chose the MathTutorDVD products though. First, I own some already, so it isn't completely a new purchase. But a bigger reason is that Jason Gibson is someone my kids can respect when it comes to math. He had a dream job (involving physics and math) working in the space program at NASA. So my boys take him seriously when he talks about why the math is important. For right now, that matters to me too. So hard to find the perfect program, isn't it? Thanks for the recommendations- my boys especially prefer the computer based programs!